AC Milan planning moves for Liverpool duo? 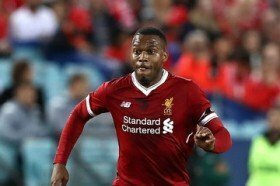 Liverpool duo Divock Origi and Daniel Sturridge have reportedly been earmarked as potential targets for AC Milan when the transfer window reopens. The duo were handed starts during the recent league game against Burnley but there remain doubts regarding their long-term future with the Merseyside giants. According to La Gazzetta dello Sport, the Rossoneri may seek to pursue one of the pairing at the turn of the year after giving up on their interest in re-signing Zlatan Ibrahimovic from LA Galaxy. Origi has barely participated for the Reds first-team this season, although he has recently earned around 90 minutes of league action while scoring the crucial winner against Everton in the cross-town derby. Sturridge, on the other hand, has looked a different player for the Reds from recent seasons but his form has not warranted a regular starting role under Jurgen Klopp. The England international has just seven months remaining on his current deal and so far, the club have yet to find a breakthrough in terms of extending his contract.